Have you ever wondered what would happen if you woke up on an island, surrounded by your peers (which happen to be frightened, adolescent boys)? No? Neither have most people. This remote possibility is, for the most part, contained within the realm of fiction. Close your eyes, imagine the fear. Imagine the smell of the saltwater, the juxtaposition of a dreamy beach with a pulverized airplane. Coconut trees are laid flat and splintered where the wings trampled the nature that had been untouched for so long. You are sore from the crash, tired from the stress, and warm from the sun beating down on the gritty sand between your toes. All of that is enough to confuse any grown individual. Whether you are twenty, or eighty-eight, you would still feel a rise of panic within your throat in that predicament. But take a moment to visualize your panic as a ten or five year old. A few days ago you were just learning how to stand on your step stool and wash your hands, and now you are abandoned without any signs of an adult presence nearby. Your experiences with tragedy are limited to Saturday morning cartoons. And yet you somehow feel an excitement, a sense of responsibility for your life, for your actions. Children in our society seldom are subjected to such a burden because they are not attributed with the characteristics necessary to lead a stable, non-chaotic life. I mean, when I was ten I laughed at awful jokes and was afraid of the dark. Me, on a deserted island? What a joke. I try to think that I would probably perish if I had found myself in such a situation as a kid. Morbid as it may seem, I cannot imagine myself hunting wild pigs or being vulnerable to the wilderness. However, I write that from the safety of my desk, where I do not feel the threat of nature imposing upon my health. 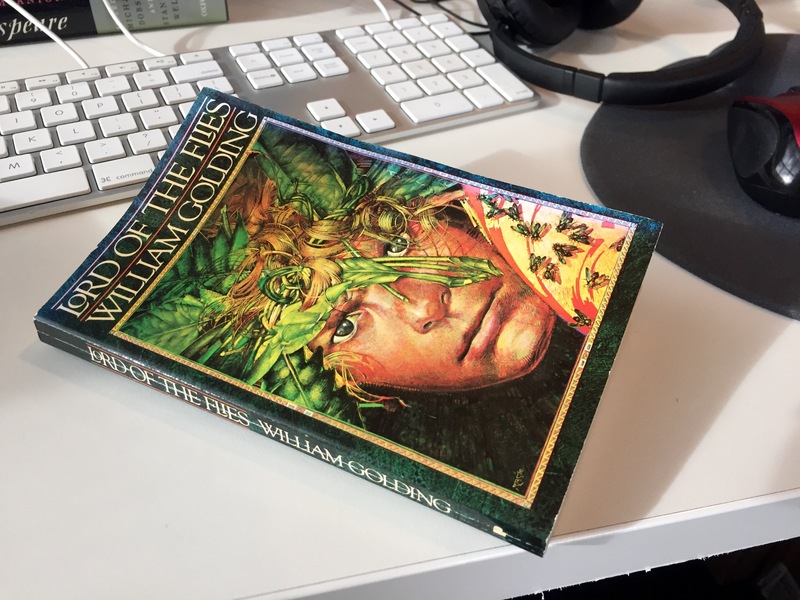 William Golding’s Lord of the Flies proves my preconceived notions wrong on both the fronts of my childhood mental capacity and my willingness to grapple with nature in order to survive. This novel, well-hated in high schools throughout the nation, is certainly a force to be reckoned with. And I get it. The story is hard to relate to and the characters are frustrating. We feel for the overweight boy who gets his glasses crushed, and we burn with hatred for the bully that leads the little children down a path of frivolity rather than practicality. The worst part about books like this is that they make you feel things, and they are not good things. We want to deny the book the ability to do this, so we call it “bad” in the hopes that our refusal to allow it into our minds somehow negates the message that it conveys. Unfortunately, ignoring the text does not remove its truth. The novel demonstrates the innate wildness of humans and our ability to revert back to primitive ways in order to survive and feel dominant to those around us. The boys follow a downward spiral, beginning in order with choir robes and meetings, and ending with murder and faces painted with clay and blood. Yeah, the book might have sucked when you read it the first time. You hated Jack for being mean. You hated Piggy for being a smartass. You hated Ralph for not following along with the crowd. You disagreed with the decisions of the characters based off of how you think you would react – but there is a flaw in that logic. You are making these judgments of character from a cozy armchair, from under the covers of a bed, or from a computer desk. You are not standing on a beach, watching your safety burn away in the wreckage of a plane. William Golding’s novel is not a fictional tale about some boys who turn on each other in the wild, but rather is a statement on behalf of humanity, suggesting that even the most innocent among us are capable of vastly changing, and even descending into primal carnage, when we are placed into a life or death situation. Crack open that novel again. Read it, be angry at the stupid decisions, and recognize within yourself that Golding is speaking to you and your inner child, your innocence that would be so quickly dissolved if you had to actually battle with the forces of nature in order to survive.